Author, "What Would Google Do?" Jarvis delights in highly interactive conversations with his audiences, speeding around the room like Oprah to tackle problems together. Jarvis is director of the Tow-Knight Center for Entrepreneurial Journalism at the City University of New York Graduate School of Journalism. 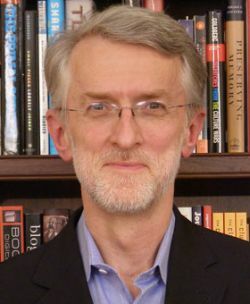 He blogs at Buzzmachine.com, tweets under @jeffjarvis (with 100,000+ followers), and posts at Google+, where he has more than 2 million followers).Jarvis is also cohost of the popular weekly podcast “This Week in Google” and writes frequently for the Guardian. Previously, he was creator and founding editor of Entertainment Weekly magazine; TV critic for TV Guide and People magazines; president of Advance.net, the online arm of Advance Publications (Conde Nast and Newhouse Newspapers); Sunday editor and associate publisher of the New York Daily News; and a columnist on the San Francisco Examiner. He has consulted for media, retail, and technology companies. He has been a business keynote speaker and moderated at conferences around the world – including South by Southwest, the World Economic Forum at Davos, and Picnic; for industry associations ranging from technology to law to libraries and even to truck-stop and retirement-community owners; and for companies, including Salesforce.com, Hearst, Gucci, LexisNexis, Axel Springer, and Holtzbrinck. For availability and speaker fees, please contact Jeff Jarvis’s speaking agent at Chartwell here, or call +1 972 385 1021 for U.S. inquiries or +44 207 293 0864 for international inquiries.